1. You Give "Of" A Bad Name. In NCAA football we have Miami and Miami of Ohio. Perhaps in basketball, we should have Miami and Miami of Florida. Who's with me? (Charges out of Delta House) ... (Returns) What the f**k happened to the Deadspin I know? Where's the spirit? 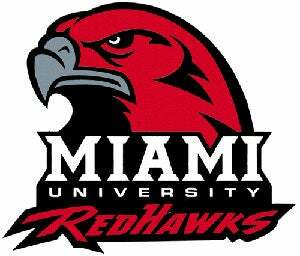 The Miami University RedHawks have qualified for the tournament of 64 — I mean 65 — for the 17th time in school history. The one in Florida has reached the tournament but a mere five times. MU also has twice as many tournament wins as "The U." (Six vs. three.) Miami University has hardly earned the consolation of using the "Of [state]" when it comes to basketball in March. And we're just the folks to change that thought process. LET'S DO IT! 2. I Wonder What That LeBron Guy Is Doing Now. You may not believe this, but the guys playing for Miami this season had trouble against LeBron James in high school. The Brothers Pollitz (Eric and Tim) lost in consecutive years to James and company in the Ohio Division III quarterfinals in 2002 and 2003. Doug Penno — that dude who hit the banked 3-point shot to beat Akron in the silly MAC Championship — was on the team that lost to James' high school in the state championship game, 40-36. So could it possibly be construed as ironic that Penno and Pollitz won a conference championship on the very court on which LeBron James plays professionally (Quicken Loans Arena)? No? Yeah, I didn't think so either.